Once upon a time, the princes had toys, costumes and other stuff they neatly put away when they were done playing. 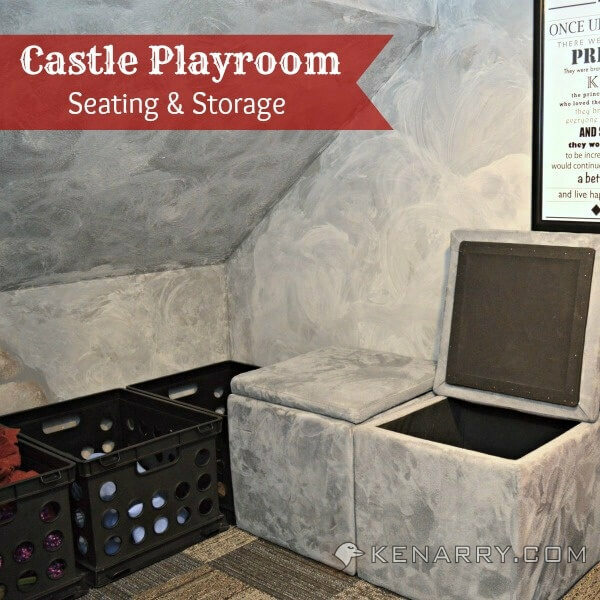 Castle playroom seating and storage would be a necessity, if I wanted this fairytale to come true! 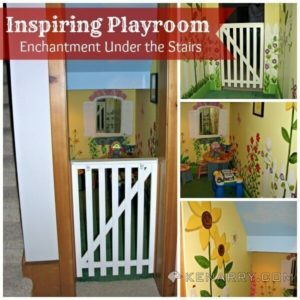 We’re nearing the end of our series about the castle playroom we created for our boys under the stairs to the lower level of our home. 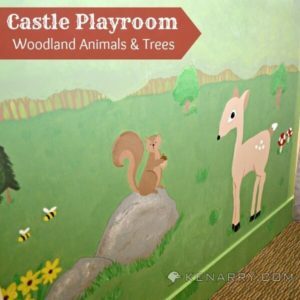 We’ve covered how we created faux stone walls, sewed a curtain, painted a woodland mural, installed carpet and decorated it. 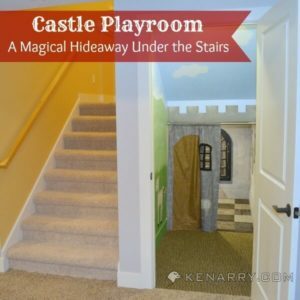 This fairy tale hideaway wouldn’t be complete, though, if we didn’t also add castle playroom seating and storage where we could literally hideaway the toys, books, costumes and other junk the boys will collect in there over the years to come. 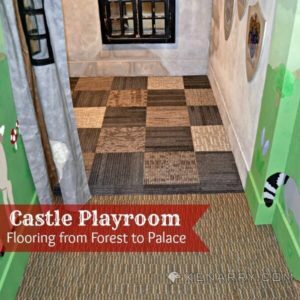 Large Floor Pillows: The castle playroom floors are only carpet squares on top of concrete. We knew we needed to add some cushions and seating to make it more comfortable for the kids — and for us! Fortunately, I had four extra large square floor pillows that have been lying around here for years. The fabric has a slight sheen to it and red stripes giving them a regal appearance for the castle playroom. My four year old and I like to sit on one and prop one up behind our backs like a make-shift couch when we’re snuggling in the castle playroom reading books. Storage Ottomans: I picked up two of these great faux suede ottomans at a discount retailer for only $17 each. 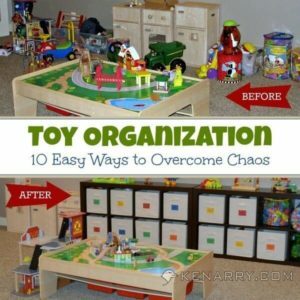 I didn’t want to invest a lot of money in furniture for a playroom. 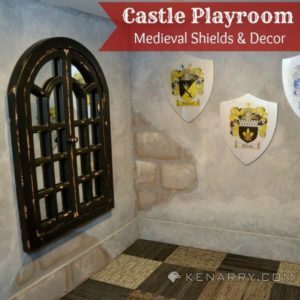 These are great since they double as both castle playroom seating AND storage for the castle playroom. The lids are removable so you can hideaway toys, blankets, books, costumes and more when they’re not in use. The ottomans are also the perfect height for the short castle. Most adults can comfortably sit on the ottomans without banging their heads on the ceiling. 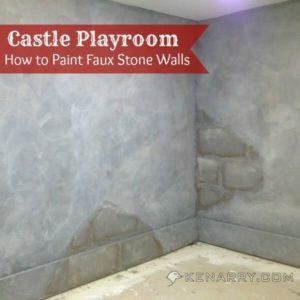 Storage Crates: I debated about what to put in the far back corner of the castle for toy and costume storage. The whimsical garden playroom that inspired our castle had a bookshelf and a laundry basket in the back of theirs. I had trouble finding a bookshelf to fit our dimensions. 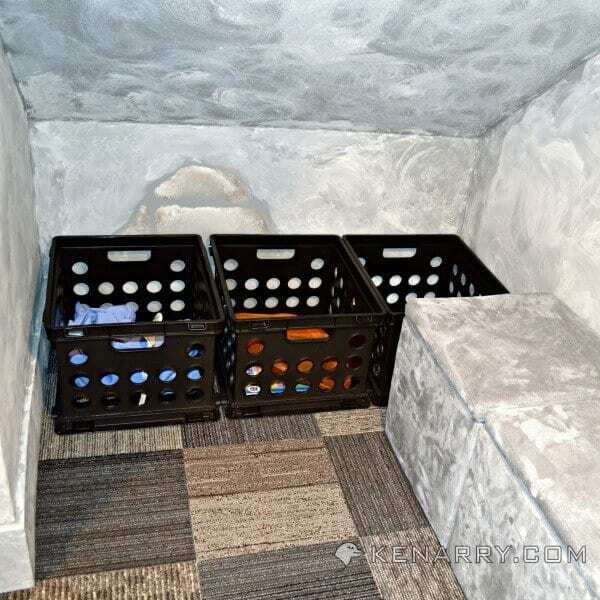 When I bought the storage ottomans, I stumbled across these cheap black plastic storage crates. They were the perfect width to fit three side-by-side in the back of the castle. I grabbed them and figured I could always use them for something else if I found a bookshelf, toy box or something I like better some day. My four year old hasn’t figured it out yet, but the black storage crates can also stack on top of one another or be turned on their sides, giving greater flexibility for however he and his little brother choose to use them on their castle adventures. – We gave these to our son as a “castle warming” gift. He got to open them and choose one to wear for the big reveal when he opened the playroom door for the first time. For photographic purposes, I hoped he would choose the crown, but mommas don’t always get what they want. He chose the flashy rock star hat instead. Rock stars can have castles too, right? – It velcros around the neck so it’s resizable and doesn’t choke the kids. The blue velvet fabric is lush and made with high quality materials. I also like how the royal insignia on the back of the cape is an embroidered patch and not cheaply painted on. In addition, I looked around the house and gathered old hats and scarves we haven’t worn in years. My sister-in-law who’s a medical assistant also gave us an old scrub top the boys could use to dress up like a doctor.
. If you ever come to visit, our son will make sure you get a tour of the castle — and he’ll probably make you choose a hat to wear too! 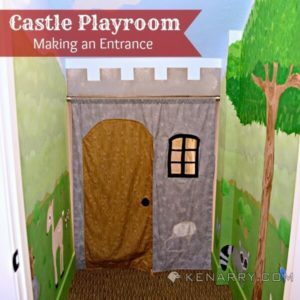 Join us next week when we wrap up the castle playroom series. 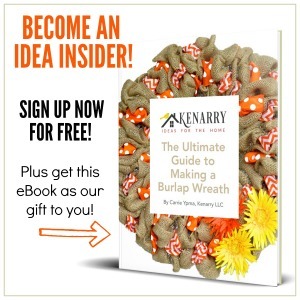 If you’d like, you can subscribe to Kenarry to get ideas in your in-box, so you don’t miss it. It’s coming along well!! What great accessories!! I have enjoyed following your progress, thanks for linking up to Stumble Into The Weekend! Thanks, Doree! See you there!